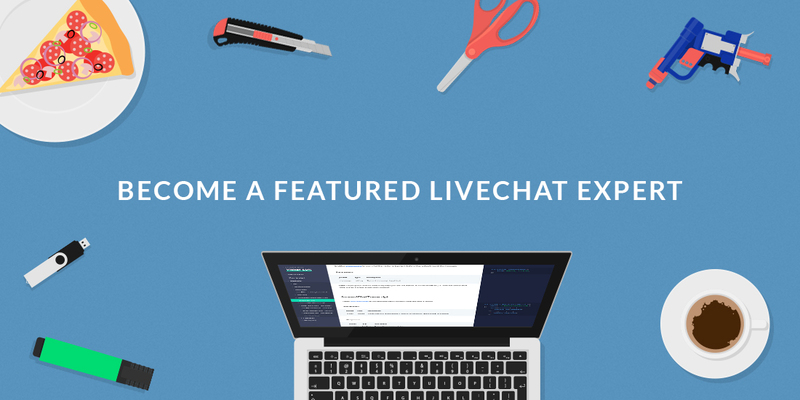 LiveChat for Developers Blog - Become a Featured LiveChat Expert! If you enjoy fiddling with LiveChat and want to expose yourself to more business opportunities, you’re in the right place. LiveChat serves over 21,000 companies around the world. Each of them has its own business requirements and often needs more than the vanilla live chat software has to offer. What if, however, a company has no developer at hand to build an app or an integration for them? This is where the LiveChat Experts Marketplace comes into play. We will feature the experts on the LiveChat for Developers website. How to become a featured LiveChat expert to get more business opportunities and contribute to the LiveChat community? Just create a sample Visitor SDK implementation: it can be a simple chat widget built in any technology (Angular, React, jQuery, Vanilla JS), a web or a native mobile widget or any other use case. Send it our way and if it goes through the review process successfully, we will add it to our documentation along with your name and contact details.